My husband and I went away for the weekend to Atlanta, GA–about a four hour drive from our home. I learned a few things about myself while away. I could spend way too much money in IKEA with ease. 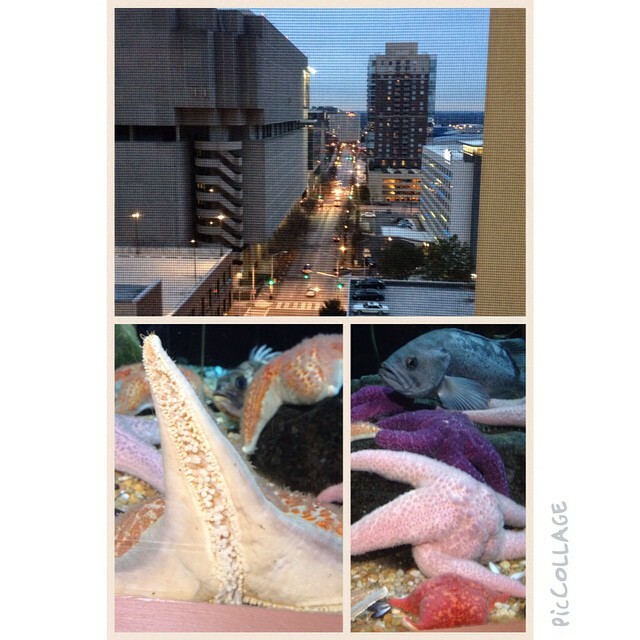 Atlanta at night from our balcony, and starfish at the GA Aquarium. The Georgia Aquarium is super busy on Saturdays, made worse (I think) because it was cold outside. I wouldn’t want to live in a city. There too many noises all through the night–sirens, whistles, people yelling, and cars honking. Someone even knocked on the neighbor’s door (loudly) at 3am. I LOVE my sleep number bed. I slept, what times I was able to do so (see previous point), on the couch because the bed where we stayed was too hard and made my back hurt almost as soon as I laid down. The Hard Rock Cafe is a cool place to eat. ONCE. It was far too loud, though the memorabilia covering the walls was neat. Centennial Park is empty and kind of boring when it’s cold outside. I assume it has more enticements in the summer. I am way more out of shape than I would care to admit. The Fault in Our Stars is a decent, but quite sad movie. It had a fair amount of language and the use of God’s name in vain, but…if you want to cry your way through a movie, it’s a movie to see. I love my husband. A LOT. Okay, so I knew this one too, but, hey, it was a get-away weekend with just the two of us. I would be remiss if I didn’t include it. We did a lot of talking, listened to a set of marriage CDs, and just enjoyed being together.